They say you should learn from those who are better than you. And that is completely true. Even if you don’t think your competitors are better than you, there’s always things they are better than you at, and that you can learn from. Whether you want to admit it or not. Creating a successful social media strategy is difficult. There’s no doubt about it. That’s because there are so many things that goes into one. Content creating, caption writing, customer interaction, customer service, and so on. One person don’t know everything, but every person knows something. The beauty about looking at your competitors’ social media strategies is that you don’t have to replicate everything they are doing. Only the best parts! The parts they do best. But when you pick something from everyone, that’s when you will succeed on social media. In this article, we’re looking at 5 great things your competitors are doing on social media, what you can learn from them, and how you can implement them into your very own strategy. In case you didn’t know, sharing user-generated content, whether it be on your website, blog, or social media, is tremendously powerful for your brand. User generated content also includes things like reviews, and not just purely images of your products. Just to clarify a common misconception. I could list a hundred statistics to show you how important user-generated is, and how you’re missing out big time if you aren’t using it. But instead, I’ll list the most important statistics and facts, because really, the ones I’ll present are powerful enough. User generated content is 20% more influential than any other type of media. Yes, user-generated content is that powerful. The least statistic prove that UGC is not only about showing people who people buy your products and love it. It also comes off as more authentic, which also helps you engage with your audience in a better way. I can promise you that some of your competitors are among those 87%. Because it means that you can look at their strategy of sharing UGC, see what makes it successful, see what parts of it are less effective, and ultimately implement an improved version into your own social media strategy. Just look at how H&M takes advantage of content generated by its users, and the power that comes with it. 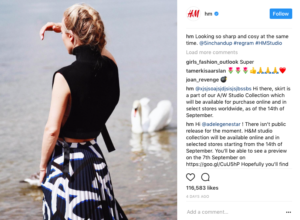 No, UGC doesn’t make up every single post of their posting schedule, but every now and then, they share content from their customers. If you’re a large company, you probably have a ton of people sharing photos of your products, so why let them go to waste? Look at how many posts the hashtag #HM has on Instagram. Close to 6.5 million posts! If you’re a small company, don’t worry. You shouldn’t get discouraged by the huge numbers of UGC the large corporates see. Even if it will be difficult to reach their level, getting people to share content about your brand and product is certainly not impossible. There are quite a few approaches you can take to encourage people to share their experiences with the world. If you choose all of them, good for you! That means you’ll probably see more of it. Did you know that there is a possibility to have a reviews section on your Facebook page? Often times, the reason people aren’t leaving reviews is because they don’t think about it. You’d be surprised how much a review section on your Facebook page can do for your reviews, because that way, people will see that section every time they come across your Facebook page, and might consider writing one themselves. To activate reviews on your Facebook page, you need to make sure the category of your business is “Local business”, in your page’s settings. You can learn all about Facebook reviews on Facebook’s information page. 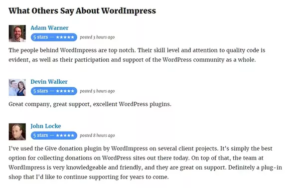 Here’s an extraction from WordImpress’s Facebook reviews. Often times, your customers need a push in doing something. Most people ask the question “What’s in it for me?” when they’re asked to do something by a company. And more times than not, there’s very little in it for them – or nothing at all. Therefore, by rewarding those who take the time to share user-generated content, you show them that you value their time, their post, and want to give something to them as a way to say thank you. What happens when you do is that you’ll see more and more people doing it. And as you can guess, the better the reward, the more people will do it. A reason to why you aren’t seeing as much reviews as you hope for might be because you aren’t telling your audience what type of content to create and share. Chances are that you don’t tell your audience what type of UGC they should share, because the statistics aren’t speaking for it. If you do, well done! You’re already one step ahead. You can use the other methods as well, such as implementing Facebook reviews, and rewarding those who share UGC, but if you aren’t specifically telling your audience what it is you want to see, people will feel lost and might end up not sharing UGC. And that means missing out on two things. First, you miss out on the greatest exposure there is: content shared peer-to-peer. Because 92% of consumers trust their peers’ reviews above anything else. Then, you’re also missing out on valuable content that is more powerful for marketing purposes than professionally created content. Here, hashtag campaigns have shown to be highly effective. For example, asking people to share a picture of them using your t-shirt in order to join a giveaway, and adding your personalised hashtag for you to find their post. There’s a whole art behind personalise hashtags (more on that further on), but what I will say is that personalised hashtags, like trends, attract people to join in on the fun, which ultimately leads to more exposure for your brand. Related: How to create a personalised hashtag and why you should. This is a mix between 2 and three, because you clearly state what they need to do in order to join, and then tempt them with a chance to win something. User generated content falls within the social proof frames, but social proof stretched much further than what UGC does. There are 5 types of social proof. Since we’ve already explored the part of social proof that is user generated content, let’s dig into new, unknown places of social proof. Most of the names regarding social proof are self-explanatory, but the last two aren’t. The wisdom of the crowd means taking advantage of a big number you are seeing, to convince people that since X people have already done Y, Y must be awesome – thus tempting them to try it. It’s just like the mindset about restaurants. If you pass by one that is completely empty, chances are you won’t go in. If the restaurant next door is packed of people, humans are most likely to stand ni line and wait, because the food must be awesome! And even if the wait is long, it’s still worth it, because this many other people think so to0. Chances are, your competitors are using this in their social media marketing to convince people about their brand’s and product’s benefits. Can you see how Skillshare uses social proof in their Facebook ad? Of course you can, because once you’re aware of the method of using social proof to generate better marketing results, you can’t miss it. And that’s what people do! And that’s what some of your competitors take advantage of. What this doesn’t factor in, though, is that of those 2 million+ students, 90% of them might be unhappy. The same goes for restaurants. Even if the food is terrible, and there’s plenty of people there, you’re most likely to go there, as opposed to an empty restaurant next door. In other words, social proof might be inaccurate to trust as a consumer, but it’s always accurate for brands, because it works! I don’t want to be a downer but us humans are stupid enough to fall for it every time! The other word, “Wisdom of friends” basically meant that you can impact your friends one on one into doing or buying something, often by telling how great the brand is, or how much you love the product. And it’s not surprising, really, when you look at the statistic we read earlier about 92% of consumers trusting their peers. The punchline is that your competitors are probably using social proof in one way or another. Social proof can be incorporated in your social media in a ton of different ways. You can share an image quoting a customer’s review, write about how many people are using your service or have bought your product, in the caption, or, you can tell your social media audience how many people have shared their experience with your brand using your personalized hashtag. First, you show how many people are using (and loving(?)) your brand, and then, you encourage more people to start using your hashtag! This brings us to the next point. Personalized hashtags. This is something that most brands use, and probably most of your competitors as well. If you haven’t implemented it into your own strategy yet, now is the time. I’ve already touched briefly on the benefits of personalised hashtags, such as increasing exposure, and leading to more user-generated content. However, now, we’re digging even deeper into the world of personalised hashtags, because they have a ton of benefits. As you can read in the article How to create a personalised hashtag and why you should, your hashtag can be anything, but there are some things you should consider when creating one. First off: Don’t make it too long, because people will be scared by it. Your hashtag should be short, snappy, and easily remembered. Secondly: Don’t include a bunch of numbers. Thirdly: Your hashtag can be anything from your brand name, to a cause it is meant to support, or your very own slogan. It’s no surprise McDonald’s use and promote the hashtag #ImLovinIt on social media, because it is their well-known slogan. What’s more, it has been able to accumulate over 460k posts on Instagram alone. It’s also no surprise that Subway is using the hashtag #KitKat and #MyBreak, as the first is their brand name, and the second is a variant of their slogan “Have a break”. 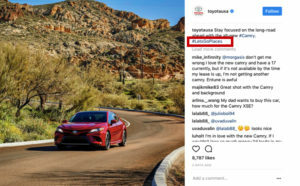 Personalised hashtags, or custom hashtags as they’re also called will yield only the results specific to the unique hashtag, thus helping you do build a community around your brand, and make your customers a part of it. There’s a reason to why brands like Dollar Shave Club has gotten so successful, and one reason is that they’re building a community around their brand, and making their customers a part of something bigger than being only a customer. Having your own hashtag can also help you build credibility by becoming a trendsetter instead of someone who follows trends. Using your own hashtag will let your audience know that you’re a business who is looking to engage with them, and that you are ready to listen to your opinions and thoughts. You’d be surprised at how many brands are sharing content they love, and not content their audience like. However, it’s not surprising, really, because how can you possible know what your audience likes? If you see a competitor of yours sharing incoherent content, and content that their audience doesn’t seem to resonate with, you can be quite sure that they don’t have a strong or thought-through content strategy. Or even worse they might not have a content strategy in place, at all. Jumping in on social media without a strategy is like looking for a treasure without a map. If you don’t have a strategy, you probably don’t have a clue about what content your audience likes, and what type of content they want to see more of, thus limiting your success on social media. In contrast, if you see a competitor of yours that have a very appealing social media feed, chances are that they have a well thought-through content strategy. Creating a social media content strategy isn’t a difficult task. You just need to ask the right questions. In fact, many of the questions are already answered with your business plan and social media strategy. How do I want to present my brand? What people am I targeting? Which are my ideal customers? What interests does my ideal customers have? The personality you have on social media should be the personality a customer is faced with no matter where they encounter your brand. By having a consistent personality and brand message, your audience will have an easier time recognising you, and remember you. Hopefully, the personality you wish to have as a brand resonate well with your target audience. Because, really, that’s the whole reason behind having a brand personality. To present your brand as a person that your audience can and want to engage with. They’ve been able to build such a huge empire, not only with the help of clever marketing, but also with the help of a consistent brand message that is true to their values, and that resonate with their audience. 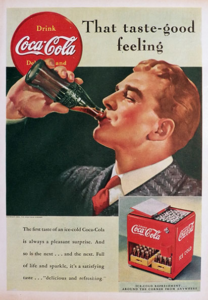 This is a Coca-Cola ad from 1939. 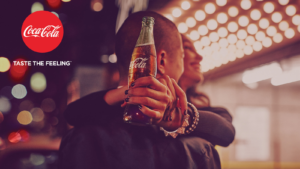 This is a Coca-Cola ad from 2017. “That taste-good feeling” versus “Taste the feeling”. Notice how their slogan and message has hardly changed, even though it has gone 77 years since! Coca-Cola stays true to its personality. That’s one thing that is for sure. And look at them now! Okay, their success isn’t only because of their consistent personality and visuals, but it is an important part of their success that can’t be denied. Your competitors are doing a ton of bad things on social media. Well, they’re also doing plenty of good things as well. Everyone can’t be good at everything, but everyone can be good at something. By looking at your competitors and analyzing their social media strategies, you can extract only the things that are helping them achieve good results , and ignore the things that are hurting them, and slowing them down in reaching their goals. Even the competitor that you consider as terrible in business do great things on social media. When looking at your competitors, don’t see it as “I am better than all of them”, because that is usually not the case. And even if it is true, you are not better than them on every single little part that goes into a successful social media. The same approach goes with life. So take your time listening and analyzing.